A Special Offer from Revolution Foods! Our friends at alumni company Revolution Foods have a great offer for local small businesses. You can read the details below but we can tell you that, in short, it involves, lots of delicious snacks, and free breakfast for your entire team! Buy Lunch Bundles at Costco to power up your office and we’ll come serve you a hot pancake breakfast! We are excited to announce that our Lunch Bundle Superfood 3-pack is available now for a limited time at select Costcos across the Bay Area. Lunch Bundles are a ready-to-eat snack (for adults) or lunch (for kids). no artificial flavors or preservatives! or, save a trip to Costco and purchase these via Instacart and have them delivered directly to your office! We will come to your office on a morning of your choosing (starting in February) and prepare fresh pancakes for breakfast for the whole office! 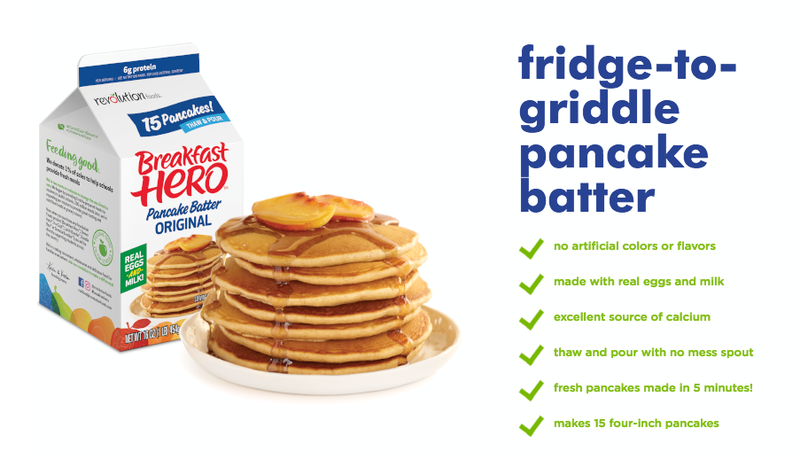 Pancakes will be made with our Breakfast Hero Pancake Batter, made with real eggs and milk, no artificial colors or flavors and comes in 3 delicious flavors (Original, Multigrain and Chocolate Multigrain). Bring some healthy snacks to your office + a healthy freshly prepared pancake breakfast AND help a healthy food company succeed at their first Costco launch! Started by 2 Moms, 10 years ago, Revolution Foods’ mission is to transform the way America eats by providing access to healthy affordable meals in schools. We believe that proper nutrition is a cornerstone of providing our youth the nourishment they need to lead successful lives. A few years ago we also launched into grocery stores with a line of healthy products for families to fuel them throughout the day. Please email Jhawkins@revolutionfoods.com with any questions. Older PostCelebrating our wins; preparing for 2017.